The mission of ICPRB is to protect and enhance the waters and related resources of the Potomac River basin through science, regional cooperation, and education. Considered the “Nation’s River,” for more than six million basin residents, the river plays an important role in the lives of all. Through regional cooperation and partnerships, ICPRB is protecting the river and improving the quality of life in the watershed. Authorized by an Act of Congress in 1940, the Interstate Commission on the Potomac River Basin is an advisory, non-regulatory interstate compact agency of the Potomac basin states of Maryland, Pennsylvania, Virginia, West Virginia, and the District of Columbia. The federal government also is a member. ICPRB was formed in response to extreme pollution levels that required a regional, cooperative response by all the jurisdictions. In 1970, amendments to the compact empowered ICPRB to address not just pollution issues, but water resources and related land issues by two or more jurisdictions. The river’s water quality has in many ways vastly improved, but threats to the river (population increases, land use change and the growth of impervious surface, chemical contaminants, and nutrient and sediment enrichment) require regional attention. The regional efforts needed to address these challenges help to inform ICPRB’s Strategic Plan. ICPRB jurisdictions are represented by appointed Commissioners. The staff includes professionals from various disciplines, including environmental engineers, aquatic ecologists, biologists, and professionals in communications. One staff member works directly with the Chesapeake Bay Program out of their Annapolis, Maryland, office. 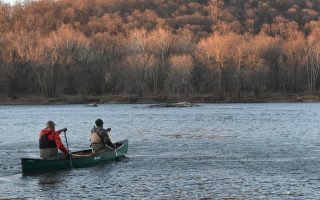 Looking for up-to-date information on the Potomac River basin? Like us on Facebook, follow us on Twitter and sign up for our Newsletter!